A deviation from the usual Chinese restaurants sent us plunging into the sea of Japanese cuisine for the July Makansutra dinner. 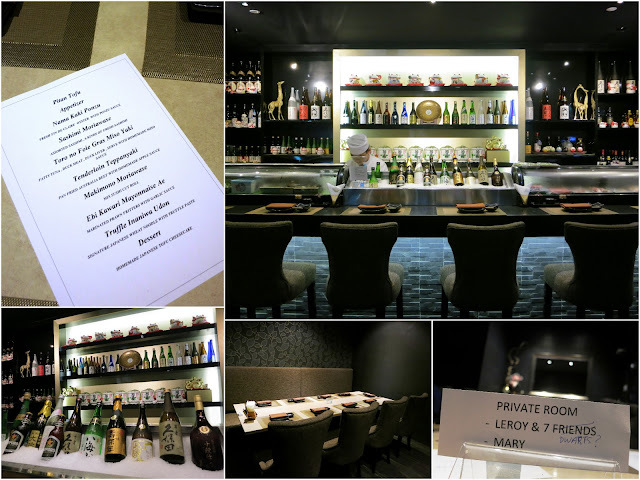 It's my first time visit to 黑金 Kuro Kin Japanese Dining located at The Grandstand, Singapore's latest dining enclave which is situated away from town, yet made diner-friendly with shuttle bus services running from several pick-up points at frequent intervals. 黑金 Kuro Kin literally means "black gold" and the restaurant is primarily awash in black, completed with dark wooden chairs and tables to match, spelling of much chicness, sleekness and sophistication. The bar and sushi counter takes centerstage and though the whole place is relatively small, it is able to accommodate a private dining room as well. Pitan Tofu, an opening dish tastefully put together simple common everyday ingredients of silken beancurd and century egg. Refreshingly chilled and topped off with a dollop of fish roe, it was a very clean and light combination of flavors to kick off the evening. Next up is Fugu Mirin Boshi, an appetizer of thin strips of pufferfish dried in a seasoning of sweet sake. Fugu is known to be a deadly fish if not handled properly, but has became a lot less exciting and almost completely safe now with the stringent checks and licensing. Previously when I first had this dish, I thought its chewy texture resembled a lot like bak kwa (dried barbequed pork), and the impression of it now still remained unchanged. It's very addictive to nibble on, with a slight fishy taste is released upon chewing, a bit like dried cuttlefish but much more delicate and pleasant. 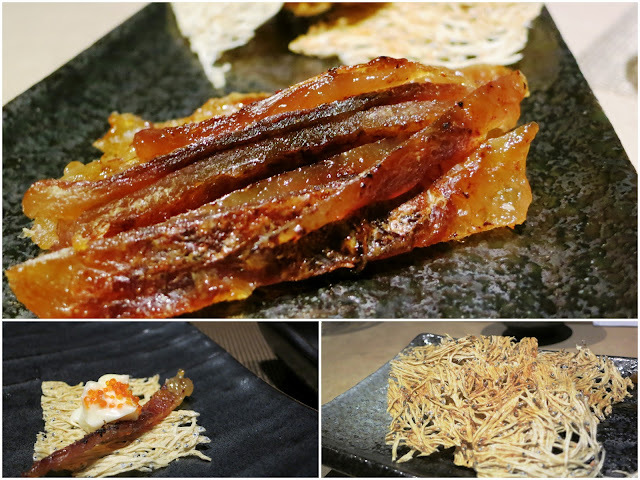 The crispy crackers of baby sardine which shared the same platter was very enjoyable too. I'm not a fan of raw food so the Nama Kaki Ponzu of Fresh Fin De Claire Oyster with Ponzu Sauce and Sashimi Moriawase of 6 kinds of assorted sashimi did not really excite me but pleases with their aesthetic presentation. I did try a slice of the swordfish and find it to be easy on the palate. Though easily receptive, I don't think I will be converted anytime soon. 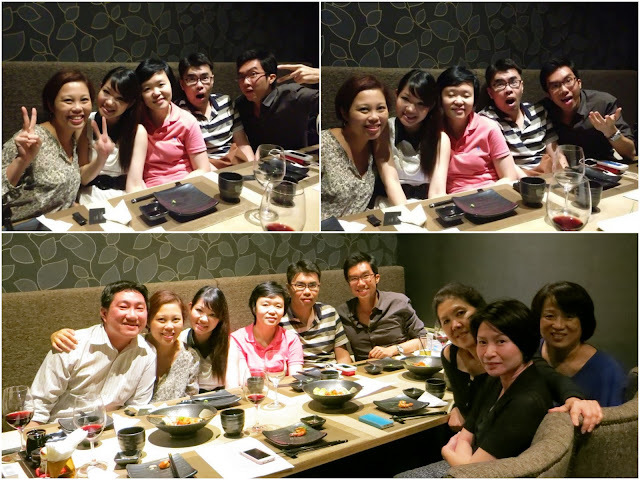 The general feedback from the table is that both dishes were suitably fresh. The Makimono Moriawase presented a trio of Mix Sushi Cut Roll, providing a much needed substantial bite of vinegared rice along with delectable fillings. 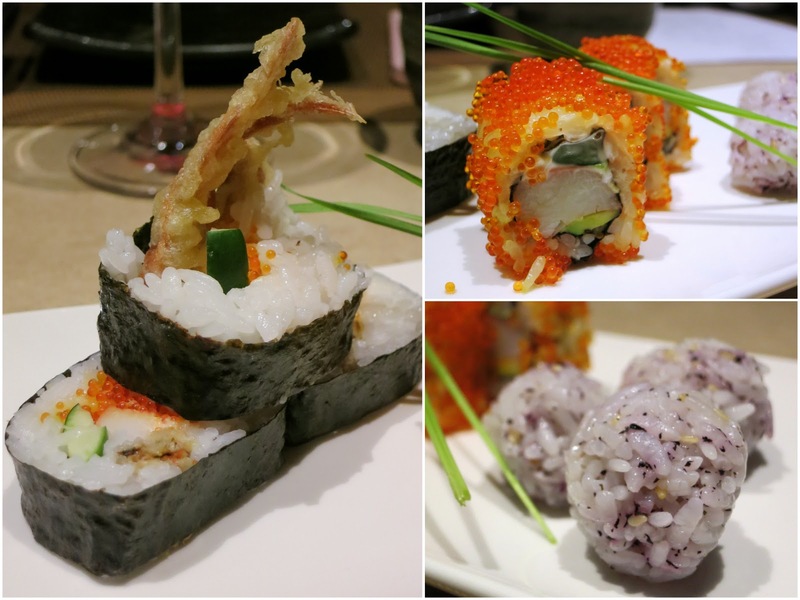 While the soft shell crab sushi and California roll looked more cheerily colorful and delighted with their contrast of textures, it is the plain-looking yet uniquely delicious tiny round plum rice ball which I enjoyed most. Finally, some warm food for my tummy! Tenderloin Teppanyaki of Australia Beef with Homemade Apple Sauce was pan-fried to perfection, giving us tenderness and juiciness in each savory cube. My favorite dish of the evening was Ebi Kawari Mayonnaise Ae of Marinated Prawn Fritters with Garlic Sauce! The prawns were big in size, with flesh that was extremely crunchy and succulent. The crustacean flavor came through very strongly in each bite, enhanced by the aromatic garlic sauce. So yummilicious! The following 2 courses were rather disappointing. Though the Toro no Foie Gras Miso Yaki of Fatty Tuna, Duck Meat, Duck Liver, served with Homemade Miso Sauce sounded like a luscious treat, the smorgborad of flavors couldn't harmonize, resulting in a confusing state of tastes which would be better appreciated if taken individually. Same goes for the Truffle Inaniwa Udon, in which the wheat noodle was very much overwhelmed by the heavy handling of black pepper, covering whatever fragrance I had anticipated from the truffle paste. Dessert was the brilliantly executed Homemade Japanese Tofu Cheesecake. Very smooth with a light hint of cheese, it was a wonderous bliss beautifully ending the evening.